Biologie agents have been used for induction therapy in renal transplantation since the 1970s. 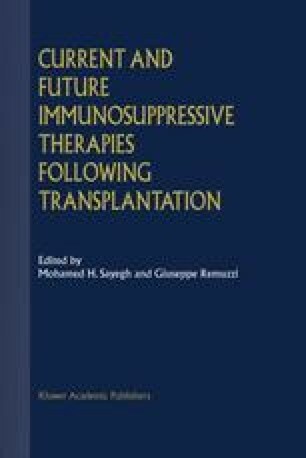 The primary objective of induction therapy has been to block T cell responses at the time of antigen presentation following allograft transplantation in an effort to reorient the host immune response toward accommodation rather than rejection. The first biologic agents that were used for induction were polyclonal antilymphocyte preparations obtained from horses or rabbits. The polyclonal antibodies result in T cell depletion thus depriving the host of immune reactive cells. However these polyclonal preparations are raised against antigens of whle cells and thus they target a variety of antigens including the costimulatory molecules, adhesion molecules and CD25. Cross-reactive antibodies also target neutrophils, red blood cells and platelets resulting in a number of hematologic abnormalities. OKT3, a murine anti-CD3 monoclonal antibody, was introduced in 1986. The mechanism of action of OKT3 consists of T cell depletion and CD3 modulation. While the polyclonal agents and OKT3 induce effective immunosuppression, they are also associated with opportunistic infections and post transplant lymphoproliferative disorders. In the latter part of the 1990s, humanized (fully humanized and chimeric) monoclonal antibodies targeting the interleukin 2 α receptor (IL-2R α) were introduced with the intent of inducing selective rather than broad immunosuppression.